I think it's official. My Little Pony is now more like Star Wars than the actual Star Wars movies. Another quick sketch. I'm aiming to do one of these every day or two, with a cleaned-up, colored version coming later. Feel free to leave comments or critiques. I hope that Mark Hamill gets a role on the show at some point. He would be best pony. 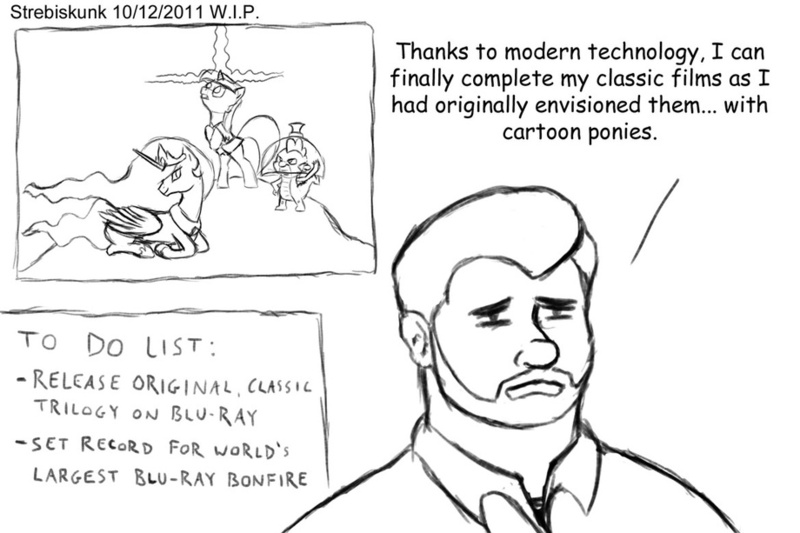 Is anyone else surprised at the lack of Applejack/Celestia out there after that scene? I expected a ponified carbonite scene or Celestia telling Applejack that she is "scruffy looking" or offering to get out and push her tractor when it breaks down. Mark would be a great guest star since he already does a ton of voice-acting. Add to that the fact that they've already made two Star Wars references (if you count the end music in the Season 1 premiere sounding eerily like the parade music from Phantom Menace), and the massive appeal to the sci-fi crowd by having John DeLancie as a guest already, and there's some good motivation for getting someone like Hamill to appear as well. As for AJ/Celestia, since you mention it, yeah, the thought did cross my mind, as they were clearly placed in the Han/Leia roles for that scene. I'm kinda surprised that I haven't started sketching ideas for it already, hehe. I was mildly irked that Even though he played as a major character on STARTREK they made a STARWARS reference at the end??? I kind of agree. It was a funny moment in the episode and all, but yeah, it would have been nice if they'd stayed a bit more consistent with the Star Trek theme. Though I also wonder if the Star Wars ending was deliberately meant to go along with the ending of the Season 1 premiere, which some have argued was a reference to Phantom Menace. Anyway, more Trek stuff to balance it out would be awesome. Hmm... A flashback episode with Patrick Stewart as Starswirl the Bearded! Hamill is just an awesome voice actor anyway. Maybe now that the show has become so popular they will be able to go for more big name guests like DeLancie. That would be great. Discord was just so much fun. I feel compelled to work on my DeLancie impression of Discord saying, "Good luck, everypony!" Permission granted! Same condition as the other one. Keep my name on it, give proper credit, yadda yadda. I look forward to seeing the results! meh I loss interest in this one for some reason. With George Lucas' track record of screwing up his own movies, by continuing to change them this pic seams legit. Though it would make it 20% cooler. Lucas: "People have always wondered why Rarity turned to the dark side. So in the prequels, we've made it so she's just always greedy and selfish." Oh my goodness! Season 2 Rarity makes so much sense now! My Little Pony is now more like Star Wars than the actual Star Wars movies. ‌My Little Pony is now more like Star Wars than the actual Star Wars movies. How?